The London Fog: Citizens! 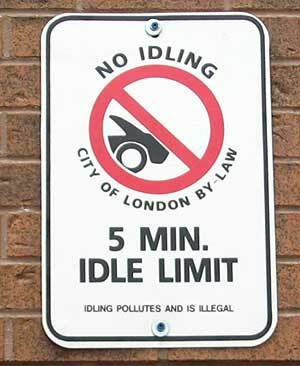 No idling and don't stray too far! As noted previously, London has a lot in common with Huntsville. Pollution is not only sending people to hospital but killing them too, according to a draft air quality position paper released by the Muskoka Watershed Council. The report bases its numbers on information obtained from the Ontario Medical Association (OMA), according to council director of water programs Judi Brouse. Updated numbers provided by Brouse indicate that 73 people in Muskoka were admitted to hospital due to respiratory complications and 10 people died of related causes last year. Emergency rooms also felt the effects of smog, as related emergency visits were made by 324 people in Muskoka last year. And if that isn’t enough to get you to shut off your engines while making pit stops, or reduce your electrical use by simply turning off the lights, how about the fact that according to an OMA model, pollution cost Muskoka an estimated $2.7 million in health care costs and $2.9 million in lost productivity last year? “It is only going to get worse if we don’t do something about it,” warned Brouse. She added people must start seriously thinking about their effects on children, the elderly and the ill in their community. [..] Huntsville Town council was singing to the same tune two years ago when they passed an idling bylaw. Unfortunately, the bylaw can only be invoked when temperatures fall between five and 27 degrees Celsius. Huntsville municipal bylaw enforcement officer George Turner carries a thermometer with him. He said he has received complaints that cannot be enforced because temperatures have been consistently above the 27 degree Celsius mark. Since council passed the bylaw on September 22, 2003 one person has been charged. “We’ve handled numerous complaints since the bylaw was passed, but we’ve only laid the one idling charge and that was for a vehicle running across from the library,” said Turner. “They parked the car, figured they were going to be in and out of the library and the guy decided to go in and get something off the Internet on one of the computers in the library. I was beside the car for almost an hour,” he said. I do hope George Turner isn't driving around in a motor vehicle trying to catch offenders. It's bad enough he is getting paid with taxpayer dollars to stand beside an idling car for an hour. Surely the town is putting Turner at risk, in much the same way that wait staff in smoking bars are at greater risk of acquiring respiratory illnesses .... Never mind that he could have found employment elsewhere: someone must be blamed for the increased burden on the public health care system. Other suggestions for reducing smog include a low-maintenance lawn so one does not have to use the lawnmower constantly, looking for the eco logo when buying appliances, purchasing energy efficient vehicles, walking when going short distances and not travelling unnecessarily, like going to Barrie to shop. For those familiar with this town three hours north of Toronto, you'll know that shopping can be a little challenging. The box stores have been moving in, and there are plenty of quaint little shops for the summer tourists, but for those that want more than a Big Mac and bargains at Walmart, you'll want to keep driving past Barrie and keep right on going until you reach Toronto. Can't stop using coal-burning plants until we reduce energy consumption? God preserve us from halfwits with no imagination and plenty of political power. Duh,nope,we have to redoose ower power consumpshin! Of course,in private hands the problem is actively tackled. Trouble is it has been made into a political problem, and all a politician can do is ban things. July 18, 2005 12:06 p.m.